BACKTIME: Can This Teenager Save Penn State Football? 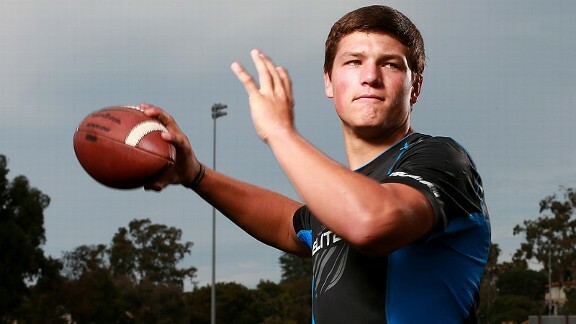 ESPN Recruiting lists Fork Union Military Academy's Christian Hackenberg as the #1 senior QB prospect in the nation. Hackenberg gave his verbal commitment to Penn State and new coach Bill O'Brien on February 29, long after the events of November had shaken the nation's consciousness. "At the end of the day, if there's football at Penn State, I'm going to be there." He's saying all the right things, and he appears to be the guy to back it up. His family comes from Pennsylvania, though his father Erick wasn't good enough to realize his dream and play for Paterno, so he walked on as a backup QB at Virginia and transferred to lower level Susquehanna (PA) so he could start as a senior. Hackenberg is enrolled at one of the top military prep schools in the nation, and has a solid family structure behind his decision. There won't be any middlemen brokering him into D1 football. On the other hand, if Penn State can't put quality personnel on the field with him against Big Ten competition, that would retard his progress to get to the pros. If his receivers can't get open and his O-Line is undersized and can't protect him, then the integrity he showed in riding the storm out would only be a detriment to his future - and his health. The thing to remember is that no commitment is official until National Signing Day - February 6, 2013. Hackenberg has plenty of time to weigh the options. If being the QB to lead Penn State out of the wilderness, and learning the offense of a man who mentored Tom Brady is the ultimate goal - is it going to be worth the sacrifice? Hackenberg and Fork Union Military (VA) begin their season this afternoon vs Hermitage (VA) in Chesapeake, Virginia at 3 PM.